Mari Frank, attorney and privacy consultant, is the creator of The Identity Theft Survival Kit, the audiocassette series Identity Theft Prevention and Survival, co-author of Privacy Piracy (with Beth Givens), and the author of two new books published by Porpoise Press (January 2005): From Victim to Victor: A Step by Step Guide for Ending the Nightmare of Identity Theft (2nd Edition, with CD) and Safeguard Your Identity: Protect Yourself With a Personal Privacy Audit. Mari is also the co-host with Lloyd Boshaw of Privacy Piracy a one hour public affairs radio show at KUCI 88.9 FM andwww.kuci.org (U. of Ca., Irvine) dealing with all issues of privacy in the information age. Ms. Frank has testified many times on privacy and identity theft issues in the California legislature and in the US Congress. In May 1999, she was summoned to the White House to a press conference to speak on Consumer Privacy, and the speech was broadcast on C-SPAN. 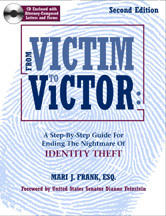 In December 2004, and March 2005, Mari’s ninety-minute PBS Television special, “Identity Theft: Protecting Yourself in the Information Age,” aired nationwide and aired again in June 2005. Both of her new books were featured as gifts for viewers who pledged support for local PBS stations. Mari consults with corporations and government agencies and provides professional speaking programs. She serves on the identity theft task force of the LA County District Attorney, and California’s DMV Task Force on privacy. She’s an Orange County Sheriff Reserve on the High Tech Crime Unit, an Advisory Board Member of the Identity Theft Resource Center, the Privacy Rights Clearinghouse, and she’s a member of the Advisory Board of the State of California’s Office of Privacy Protection. Mari is a certified trainer for the State Bar of California, a law professor, and currently teaches Conflict Management at the University of California, Irvine. Mari has appeared on dozens of national TV programs including Dateline, 48 Hours, the O’Reilly Factor, Investigative Reports, NBC and ABC Nightly News, CNN and has been interviewed on more than 250 radio shows. She has been featured in major newspapers and magazines, and her articles have been published in legal journals and magazines. Please find out more atwww.identitytheft.org. Lloyd D. Boshaw, Jr. is our radio engineer and sometimes co-host (when he isn’t too busy running the board, he asks questions too!) Lloyd has been a General Contractor and Builder for almost 30 years. He also is very adept at fixing almost anything and quick to learn the radio engineering skills. Lloyd is also a qualified and experienced mediator and arbitrator of construction disputes, and he has helped resolved many complex cases to the parties’ satisfaction. 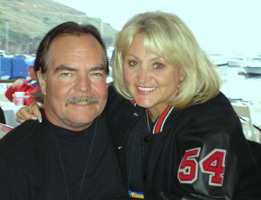 Lloyd and Mari have been friends since they met in Hawaii in 1989 and after many years married in 2001. As a favor to Mari, and as a result of his strong belief that privacy is diminishing in our society, Lloyd agreed to learn the radio skills necessary to team with Mari for this show.